Our StorQuest Self Storage facility in Dallas, TX, was designed with you in mind. Not only do we rent small and medium storage lockers to North Dallas area residents, we also offer commercial units and outdoor parking spaces for your automobiles. Our friendly on-site staff will be happy to help you select the best unit for your self storage needs. When you’re moving, the last thing you want to handle is more questions. At StorQuest we have answers. Our facility offers traditional storage lockers for your home goods, outdoor parking spaces for your vehicles, as well as online bill pay, short and long-term leases, and discounts for military and seniors. We want your moving experience to be easy and affordable. 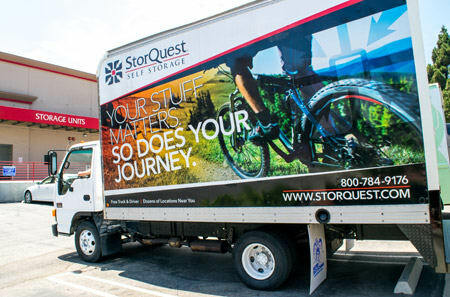 Security is our top priority at StorQuest and we want you to feel comfortable storing your belongings with us. Our Dallas facility is equipped with a number of security features including 24-hour surveillance cameras, unique gate access codes, and fenced, well-lit areas. Let your mind rest easy knowing your belongings are stored at StorQuest Self Storage in North Dallas. At StorQuest Self Storage in Dallas, we're here to make your storage experience positive. That is why we offer a truck and driver at initial move-in. We'll pick up your belongings and drop them off at your storage unit for you! On behalf of our commercial unit holders, we will be happy to accept commercial deliveries during business hours, and provide you with free email invoicing and online bill pay. This is just one of the many ways StorQuest supports local business in North Dallas. Contact StorQuest Self Storage in Dallas, TX, today to learn about more facility features.